Translation is always an act of promotion: by selecting an individual to translate, the translator or translators may simultaneously select a language, a country, a period of time, a group or groups’ identity, and an artistic and aesthetic sensibility which they will make accessible to a new public and market to that public. Testimony of Circumstances is a book teeming with cultural critique, and the choices its translators have made add to the complicated matrix of statements that emerge from it. The book is grounded in Rodrigo Lira’s curious and tragic biography, discussed in depth in the Translators’ Preface, as a man suffering from schizophrenia who ultimately takes his own life. That biography provides helpful grounding for the often ranging, at times ranting, poems, and it helps to justify the translators’ choice to proffer Lira as a major twentieth century Chilean poet. Lira’s importance as a poet is still being established, but there is no doubt that aspects of his work and life make this collection a valuable addition to Chilean poetry available in English. Soto-Román’s claim on the back cover that Lira is the “True heir of Nicanor Parra” seems abundantly true — and his work draws significantly on the irreverent linguistic play and social critique characteristic of Parra to the extent of even pointedly criticizing Parra himself in the poems more than once. What really makes Lira’s work his own, and ultimately compelling, is his personal history of mental illness and his engagement with mental illness in the poems. The play we recognize as a signature trope of Parra takes on more consequence in Lira’s poetry. If Parra’s social critiques sometimes feel like the mental gymnastics of a genius trying to endure the drudgeries of residing on earth (and in the company of Pablo Neruda and his adoring public), Lira’s criticisms show how society works actively to make earth uninhabitable for the mentally ill — starting with the dictatorship, but extending to all people: “I understand and comprehend them (generally) … their small worlds of bearable tones / somewhat pastel, somewhat grayish / or more like television colors” (from “Testimony of Circumstances”). He openly refutes his diagnosis, as when he writes in the same poem, “truly, / I am not CRAZY / despite labels / vulgarly referred to as diagnostics / that distinguished specialists / have applied to my case,” making it clear that his quarrel is with a broader establishment and institution which serves to exclude those not empowered by it. Often, he is able to achieve nuanced and evocative portraits of what it feels like to live with his condition, as in “4 Three Hundred and Sixty Fives and One 366 Elevens” when he writes, “the dirty bed sheet doesn’t cover itself” and “take one of those elevators that reads minds.” It is the combination of such vulnerable self-portraits of illness and his direct, angry rejection of other people’s framing of his mental condition that make this book feel authentic in the range of conflicting and painful personal realities it negotiates. Like Parra, Lira sees literature as a similarly corrupting institution. The sprawling title poem identifies the problem with poetry contests which prohibit poems that have “more than the hundred-and-fifty verse maximum for entries”, and its length and style (often, as in the quoted text, in prose) forcefully reject the formal constraints of the contest much in the same way the persona rejects the limited tonal and color strictures “people” demand. Yet his criticism of poetry contests also bespeaks the ambition that burned in this poet. 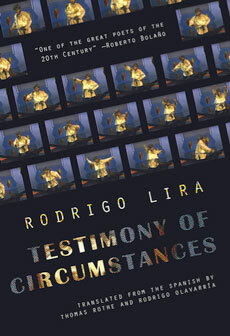 The translators make it clear that Lira’s reception by the literary community and his relationship with prominent writers was troubled: although he won a major poetry contest, his work was not always recognized, and his erratic personal behavior alienated figures like Enrique Lihn, the same judge who selected his poem to win a national prize. These aspects of the poems, and their connection to Lira’s real-life struggle with schizophrenia, ultimately serve to critique literary institutions and society more broadly, illuminating ways in which the mentally ill are harmed and marginalized by rules and informal expectations they are subjected to even outside of the medical field. The challenges Rothe and Olavarría faced in translating Testimony of Circumstances were many and monumental. Lira’s Spanish is relentlessly difficult because one of his central projects is rejecting a language that has not (or only fitfully) served his experience. The poems are full of invented words that play on similarities among words but also aim to point out their absurdity and reveal language as a tool used to enforce nonsense on sensible people (even if he is the only one). For the most part, the translators have rendered Lira’s invented language in ways that favor closeness to the original and feel at least as seamless. For “Ciertas cancioraciones sinfeccionadas, sinfectadas / de ciertas esperrancias y herideas sincereceas / -sincavidades o con carieacontecidas concavidades”, the translators give us “certain expectanxiousness and honestuttering injurideas / -nonconcaved or with cavitieafflicted concavities”. They create words like “honestuttering,” which has both a sonic ring and a sense of accuracy about it, fairly often, which is particularly impressive. When the linguistic play relies more heavily on Spanish literacy (and bilingualism with English specifically), their choices can be less effective, as when they render “Vd. y U.S.” as “You and Your Lordship.” But such disappointments are surprisingly few given how rife these poems are with such challenges. To some degree, this is a book for men. Although the translators include a quote from Asymptote poetry editor Aditi Machado’s review of the book, this follows a long quote from Chilean poet and translator Carlos-Soto Román and two quotes (one on each cover) from Roberto Bolaño, the late Chilean novelist whose work is experiencing extended posthumous popularity in the US. In reading this book, it is sometimes hard to forget that these poems were written by a man, translated by two men, and endorsed, primarily, by one famous man: Lira reminds us often of his alienation from women (in “Testimony of Circumstances”: “those entities called WOMEN”) and his sexual frustration (in “Extremely Urgent Request”: “needed / for all services / a hands-on working girl … preferably in her twenties”). His conflation of the human condition with the male condition grows apparent over the course of the book if as a reader you are liable to feel excluded by such assumptions. Still, the Lira that emerges from these poems and the obviously careful and reverent preface by his translators is a figure of extreme dynamism that I find it impossible, in the end, not to mourn. Lira has a soul that is never absent in his progressive, humane poems. His “Public Notice” begins “Notify the Poor / That Onions await them in the Municipality of Santiago” and goes on to depict the desperation of Chileans even as he paints himself as a self-absorbed artist eager to profit artistically from others’ plight: “I was in a rush — I had to do buy a map of Santiago / and a typewriter.” At the same time, this poem, by obliquely referencing the proletariat poetry of Neruda and specifically his “Ode to the Onion”, manages to somehow denude much of the Chilean poetic tradition as frivolous or falsely lofty. The introduction of these poems in English presents an opportunity to deepen our understanding of twentieth-century Chilean poetry and to get beyond the totemic names of the first half to mid-century especially. It is more, however: a sorely needed voice testifying to the reality of living with mental illness among people who don’t understand it and, through the violence of our indifference, often seek to drive out the vulnerable. Jasmine V. Bailey’s first poetry collection, Alexandria, was published by Carnegie Mellon University Press in 2014 and won the Central New York Book Award. Her second collection, Disappeared, was published October, 2017 from Carnegie Mellon, and her chapbook, Sleep and What Precedes It, won the 2009 Longleaf Press Chapbook Prize. She has been an Olive B. O’Connor Fellow at Colgate University, a Fulbright Fellow in Argentina, and a fellow at the Vermont Studio Center. Her poems, essays, and translations have appeared in Michigan Quarterly Review, Carolina Quarterly, 32 Poems, Crab Orchard Review, Two Lines, InTranslation, and other journals. She is a PhD student at Texas Tech University.